"By Baba Nityananda’s grace, I have driven every kind of vehicle, right up to fighter aircraft. (During the 1971 war, India had only 3 MiG aircraft, one of which I flew and the other two were flown by the Raja of Sirohi and his son.) I have done every activity: painting, journalism, printing, construction, theatre. Even in movies, I have acted, composed music, and also sung. I have done everything, but I never made any of these occupations a means of living by commercializing them. "I ensured construction of the Vivekananda Rock memorial at Kanyakumari in 1970, at grave personal risk. In 1972, the heads of 52 Universities from around the world came and took ME in a chartered flight to various Universities. All this while, I maintained silence (mouna). Carnegie Hall in New York was filled to its capacity of 10,000 from 3 AM to 11 PM, and all the while I did not even utter a word, while another professor lectured. Yet, every single person present there had darshan of Baba Nityananda. 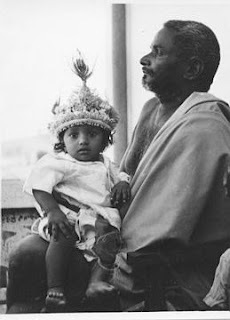 Two years later, when Baba Muktananda went on His world tour in 1974, many people came and told Him that they had seen His Guru. He told them that the one who had shown them was His own disciple! "Also in 1972, I travelled to Haridwar, where I delivered several lectures over 15 days. These were later edited and published by a professor of Punjab University as the book Reminiscences. 11 lakh copies of the book were published, each in four languages, which were all sold out within just four months. "From Haridwar, I went up to Rishikesh and then onward to Gomukh. There, MY body underwent kayakalpa (transformation). The body was totally renewed: skin, nails, etc. The whole process took place naturally over 21 days. In this procedure, if the prana does not leave the body within 21 days, then another long life is obtained. "After this kayakalpa in 1972, I came down to Shivanand Ashram in Rishikesh, where MY health gradually recovered. Thereafter I flew to Bombay (now Mumbai), and then went to Baba Muktananda’s ashram at Ganeshpuri." "During MY sadhana, I had darshan of Nava Durga. This normally requires nine bodies (births). My guru for this sadhana who lived in the forests of Katni (near Jabalapur) took nine lives to have this darshan, but I saw them in just nine months. The sadhana involves prayers to Ma Kali in the cremation ground between 12 and 3 AM every night, for 21 days. A recently buried dead body of a 14-year old low-caste girl is made as the asana. With full concentration, you continuously chant the chaitanya mantra. The eyes of the dead body open and the tongue hangs out. Maintain full concentration on the eyes, or your own life may be lost. Continue similarly for 21 days. On the final night, Ma Durga appears and asks what you wish for. You say: “Only Your darshan”, or else the other Shaktis will not appear. The entire sadhana is then repeated for the nine forms of Durga. This sadhana is very frightening, with lots of happenings all around, but you should not get scared and maintain your concentration. After one sees all this, there is no rebirth. This sadhana is necessary for those who become Gurus. (Ramakrishna Paramhansa did it, Vivekananda did not). Then I went to Abu, and then to the Himalayas. "While in Abu, I was staying on a hill top, keeping cow for milk. The devotees were visiting with their gunmen for security. One day a wild tiger came there and all of them ran off. I held Ganga, the cow, on one side and the tiger on the other, and remarked, “Different beings joined by the same aatma”. I even made them drink water from the same bowl. Then, I asked the tiger to leave and he went peacefully. "Even during MY sadhana, I always led a very disciplined life. I used to eat regularly and never went without food. I put MY knowledge of Ayurveda to good use and MY diet was always controlled and restricted." "As a boy of twelve or so, I visited Tibet and had darshan of Mount Kailash. I met a Tibetan monk named Bhaskarananda, who showed ME Tibetan manuscripts describing the experiences that I had after meeting Baba Nityananda. Bhaskarananda used to stay just 5 kilometres from Kailash. He carried ME around the holy mountain on his shoulders. I had darshan of Lord Shiva and Parvati. All the fabled places described in the scriptures are on this earth itself. Mount Kailash in Tibet is the Kailash of the scriptures. Kshirsagar and Vaikuntha are also on this earth. Amravati is near the present-day Nagpur. The tapobhoomi of Vyasa was in Punjab. But the paths of rivers change every few hundred years. The Ayodhya and Mathura of today are not the same as those in the Puranas. "Baba Muktananda was staying at Trayambakeshwar near Nasik for several years after some unpleasant incidents with the devotees of Bhagwan Nityananda at Ganeshpuri. He was observing silence. 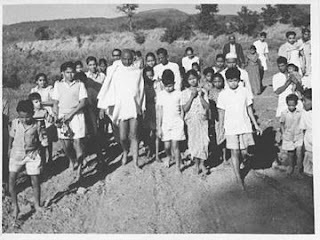 When I was staying with Bhagwan in 1959, He called Swami Muktananda back to come and stay at Gavadevi Ashram at Ganeshpuri. "Bhagwan introduced Muktananda Baba to ME and said, "He is a Paramahansa. You should serve Him after You return from the Himalayas." This was MY first meeting with Baba Mukatananda. As per these instructions, I subsequently joined Baba Muktananda on 9 June 1973 and served as Administrator in the then Sri Gurudev Ashram of Ganeshpuri. "Muktananda Baba used to set timings for job completion, one after another. I was thus engaged from 1959 to 1971. I drew up plans for all His ashrams and got them built all over the country and the world. During all this, I found time to go to Mt. Abu, Girnar and other places for sadhana." 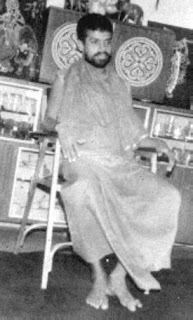 “After spending 15 days at Baba Nityananda’s ashram, which was the longest He had ever kept anyone with Him, He told ME to go and serve the country. In 1962, during the war with China, I was the first to contribute to the Defence Fund. The then President, Dr. Radhakrishnan called ME to meet him. I did relief work as a social worker after the Koyna earthquake and the Andhra cyclone in 1960s and participated in the wars of 1965 and 1971. I built the Vivekananda Rock Memorial at Kanyakumari, overcoming great odds. "Between 1959 and 1969, I was studying, but not much in school. Later, on MY own, I studied the works of Vivekananda, Ramtirtha and others. I gained general knowledge from plays, etc. At one stage, I got saturated with knowledge. For a stretch of 45 days, I was only reading and listening to lectures. Without food, water, or any action, I was just lying down, but without sleep. Psychologists were engaged, but to no avail. Finally after long walks in mountains, the spell passed. " Does renunciation come from knowledge or does knowledge come after renunciation? “I experienced everything in this world as a child. After my experience of self-realisation, I understood that there is nothing else in this world to know and there is no one in this world who can teach ME anything else. 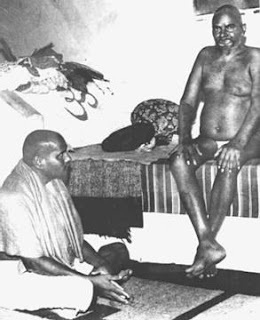 “Yet, when I was taken to Baba Nityananda, the experience of meeting Him was extremely powerful. At Baba’s ashram, I was scared of a big snake, and used to implicitly follow Baba in all His activities, right from getting up at 3 AM and bathing in the hot springs there. Had I been older than the 11 year-old I was when I met Baba, He would have sent ME away. He showed ME how I had been following Him over MY last sixteen births. MY experiences staying with Him at His ashram for the next 15 days were numerous. The gist of them all is described in ‘Reminiscences’. Param Poojya Swamiji was born into a royal family in southern India. But HE says that HIS childhood was more like that of Lord Krishna, surrounded by enemies and dangers. Brought up in the opulence of palaces, HE used to be served with an array of dishes and sweets every day. Yet, out of utensils made of gold and silver, HE would prefer to eat just boiled gram, the diet of the poorest of people. “I never fell in doubt as to what to do, what not to do; what was right and what was not. Parties used to be held at the palace, and wine used to come in crates. I never looked upon them as evil, but just ignored it all. Having experienced self-realisation as a child, I used to just climb up to the third floor of the palace and meditate, even though I did not know what the word ‘meditation’ meant. I started writing and organizing plays with other children. MY parents were increasingly concerned about MY ‘unusual’ activities. “As a school-going child, I could play all musical instruments, and was the leader of the Musical Band. Once, after returning from a long march heading the Band, wielding a massive baton, I forgot to take off MY heavy boots before stepping into the house. Seeing this, MY grandmother rebuked ME very strongly. In a fit of anger, I took off the boots and threw them at her face (breaking a couple of teeth!). Disturbed by such acts of MINE, MY parents decided to send ME to the family Guru, Baba Nityananda. This was in 1959, and I was eleven. “Baba Nityananda’s ashram (‘Guruvanam’) at Kanhangad in Kerala was in a dense forest, which had been developed over the years of Baba’s stay there. When I was taken in MY princely clothes to Baba Nityananda, He said, “Send that beggar here”. I guessed that He meant ME, so I jumped up and sat on His lap. I felt great happiness, sitting there in Baba’s lap, before a crowd of 12,000 people, which included MY parents. But the very next moment, Baba threw ME off saying, “Do you think this is your throne?” In just one moment, MY utter joy was transformed to utter shame and sorrow. Such is the Guru’s drama! He then called ME and soothed ME (since I was crying) and gave ME a sweet. Even though I used to be served eight kinds of sweets daily in the palace, I went wild on tasting the one Baba gave ME, and I started running after Him, asking for more. He had hidden the box of sweets behind Him. Finally, He threw the box at ME, saying, “Take it, you beggar!” Though I felt slighted, I couldn’t resist the sweets. I finished off those sweets and went into a trance. The Guru is not a person: the Guru is Shakti personified. Param Poojya Swamiji’s life is filled with an amazing range of experiences. HE traveled far and wide, all over India and visited 52 countries around the world. HE is an expert in every task, because HE has not only worked but excelled in a variety of occupations. 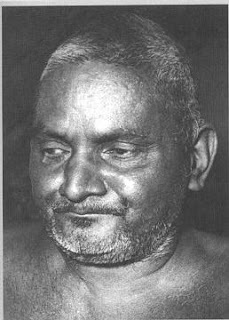 Swamiji says that HE was born by the grace of Baba Nityananda, who brought HIM to HIS parents just as Krishna was brought to Gokul. "I saw an ocean, on which thousands of little Krishnas were dancing, telling ME that this entire world is just a drama created by God. I cried for a whole day and a night, sad that all these relations of father, mother and so on, really meant nothing. 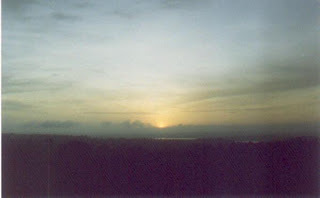 "In the morning, I saw a large, round, luminous yellow light outside my window. I could see two myna birds and one of them asked the other, "What is this?” The male bird replied, "This is the 'Sarva Vyapta Aatma Jyoti' (the light of the Self that pervades everywhere). And both of them flew off. This was liberation, and much later I would find its proof in the scriptures." This momentous event took place almost sixty years ago, on the full moon night of the month of Shravan, the day Raksha Bandhan is celebrated (usually in August).